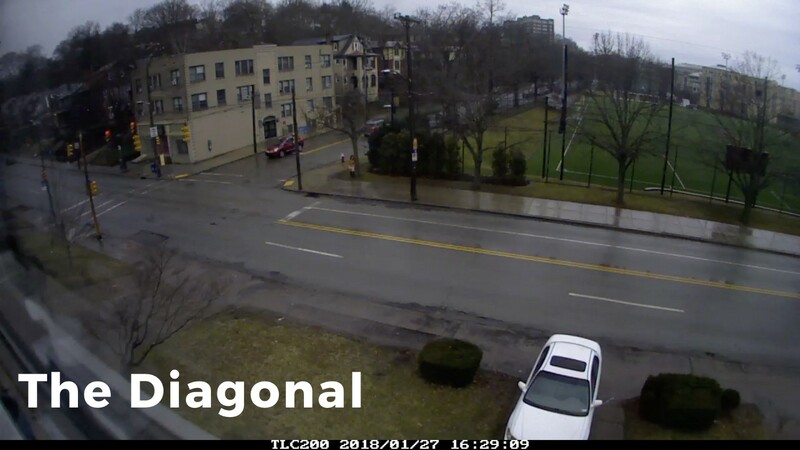 This article describes the process of my study on the Forbes and Margaret Morrison intersection near Carnegie Mellon campus, Pittsburgh, PA. This project really begin out of my desire to observe every day activity over time. Of course, one of the best ways to do this is time lapse photography. Many examples exist  of how everyday activity can be elevated by the form of time lapse photography, but that wasn’t why it was interesting to me. I found that compressing hours of time down to a few minutes reveal interesting patterns relating to the rates of change of different objects in the environment. I remember from Freshman year the difficulties that I would have when it came to documenting what I had done each day in a process book. Our memories of what actually happen at our desks often vary a lot from what we might see if we just made a list of everything that we did. This list might vary still from what we observe if we watch a continuous video of people sitting at the desk. While I was initially interested in studying the desk environment, I began to realize that the unclear thresholds and ownership issues made it difficult. I would be looking into how my own decisions regarding how the desk was arranged affected my own behavior which would make things really convoluted and unclear if any observation I made would hold for a 3rd party. However, I did learn a lot about what is necessary for a timelapse that contains enough information to learn something meaningful, and you can see that in my second version I included much more of the surrounding environment for context. As I began to realize the potential for timelapse as my primary method of research for the project, it became clear that my subject was just not scoped correctly. Instead, I turned the camera around, and began to focus on the very interesting ecosystem like intersection of Margaret Morrison and Forbes. The good thing with this intersection is that it is actually a place I am very familiar with. I bike or walk through here nearly every day at least a few times. I have personally waited for the bus there, by myself and with friends. This first hand experience did help me understand at least which elements of the space would be very prominent. After that, I setup the time lapse camera and hit record. I would record 1 frame per second, which game me the appropriate level of ‘time-detail’. This is of course an interesting quirk of time lapse photography which is that if an event occurs between the frames that you capture, it won’t show up at all when it comes to the final video. I noticed this during the initial time lapses I took at the desk, so I upped the framerate to capture everything. At this timescale, I could capture people walking and all vehicles, as well as things about the environment. When setting up the camera angle, I was inspired by the art project “Painting Reality” . The video has motorists who traverse an intersection paint their wheels, leaving colorful trails behind. While the resulting patterns are aesthetically nice, they also reveal a lot about the way that people move through the space. This project also helped me develop what kinds of insights could be taken from this kind of birds eye view time lapse of an intersection. After I was reviewing video footage from the first day, I knew that there was something interesting going on. So many people passed through the space that it was just great, and there was a ton of interaction with the buses. I didn’t realize this, but the 61 line actually has a bus pass through this intersection every 4 minutes during peak hours. That might change with the upcoming cuts to the Allegheny County Port Authority . I knew that the entire bus ecosystem would have to play some part in my research. After reviewing the initial sections of video, I knew that I was going to have to scope the project in to meet the deadline. There were a ton of different things I could observe, there is just so much packed into this timelapse footage. I played around with several ideas for how I was going to decide which factors in the environment to focus on, but I eventually settled on this framework based on the idea of shearing layers . By including the rates of change of the different elements in the 2x2, I was able to suggest which areas are ready for intervention quickly and which others might be difficult to intervene in. I chose to focus in on the lower half of this 2x2. 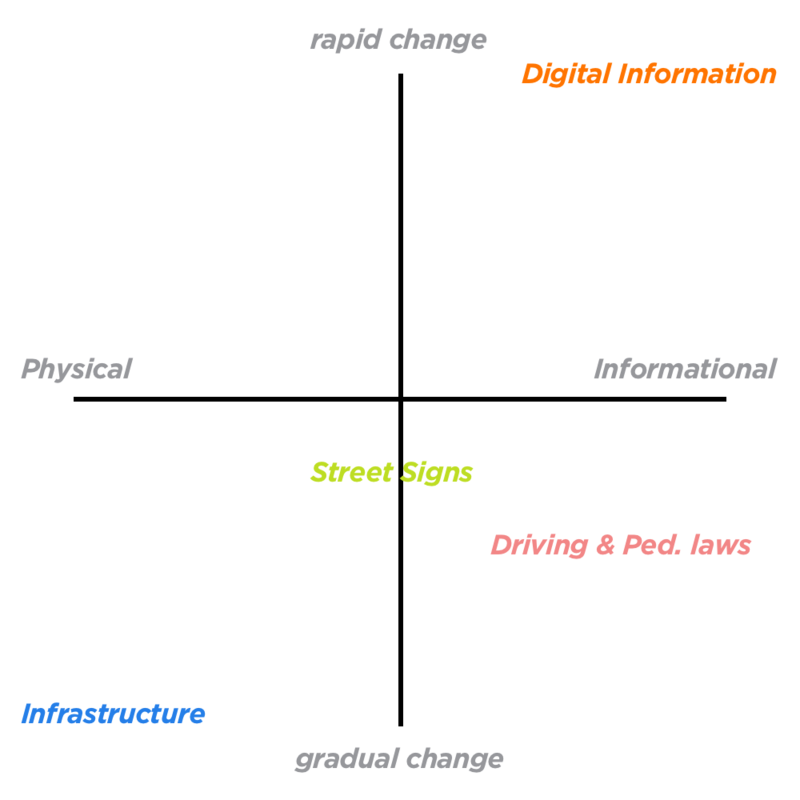 These were the factors that were exerting the most obvious push on people in the space, and I think that it could result in an interesting insight into the way that people navigate it. After collecting video for 3 days, I set in to analyze the footage. At first I was completley overwhelmed, there was just so much going on. Additionally, the way that all of the frames I captured throughout the day were being put together increased the speed to twice what it was supposed to be. After watching the time lapse at half speed (roughly 3 hrs in real time), I began to hone in on the most interesting behaviors. This project is intended to be a bit tighter in scope, so I intend to focus in on a few and analyze them thoroughly rather than try to dig in on everything that is going on. This video contains all jwalkers and other notable behavior, some not shown in final presentation. One of the most obvious things to me after looking at the footage and even revisiting the space is the amount of jaywalking that occurs here. So many people do it, clearly without thinking, as if something in the space compels them to do so. 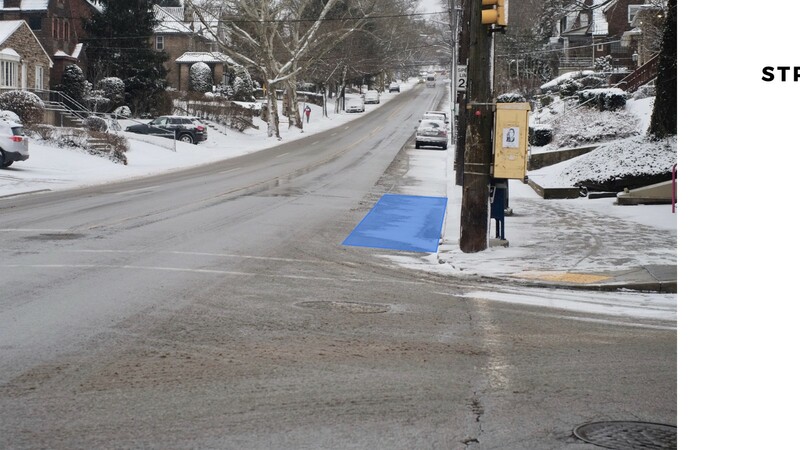 Technically in the state of Pennsylvania, unless you are at an unmarked intersection, pedestrians only have the right of way during specific times, inside the lines of the crosswalk. 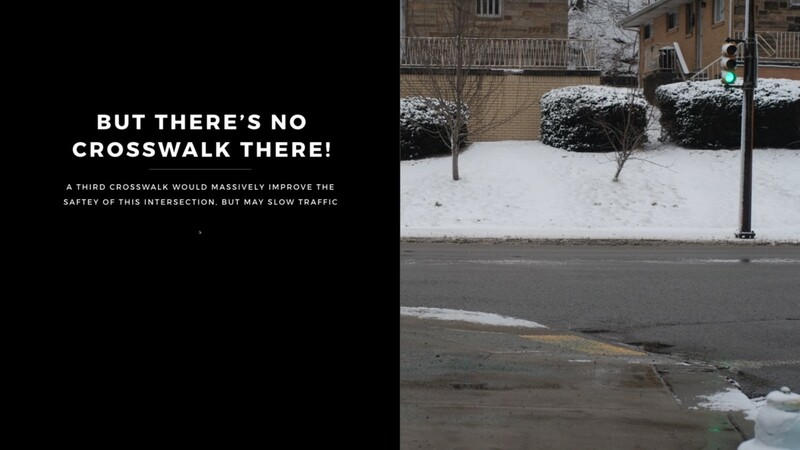 This means that the numerous people crossing outside of the crosswalk are putting themselves at risk legally as well. If they are hit by a car, the pedestrian could be found at fault. There are several reasons for this, and I think that it helps to group the jaywalkers into three categories as I will demonstrate below. 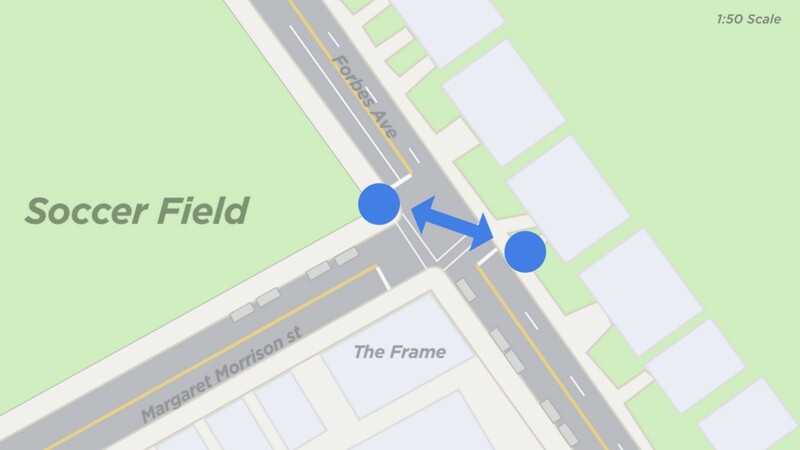 I also think that one of the things I may not have touched on in my presentation but contributes generally to the state of the jaywalking at this intersection is the long sightlines down the street in all directions. You can clearly see and hear when a car/bus is coming down the street and avoid them well before they come close to you. 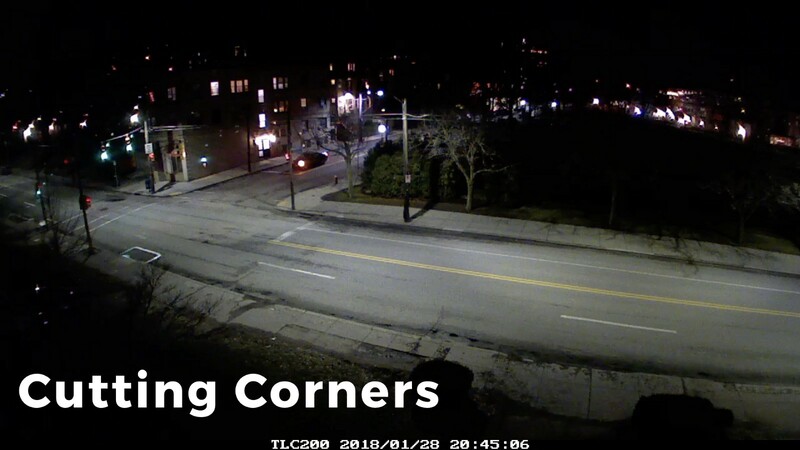 This makes students much more comfortable with jaywalking because they can see if the fixed schedule lights are actually correct for traffic conditions at that moment, etc. First is that there are very high traffic / high value locations at opposite corners of the intersection. One one corner we have the very edge of CMU campus, the soccer field and adjacent sidewalk. 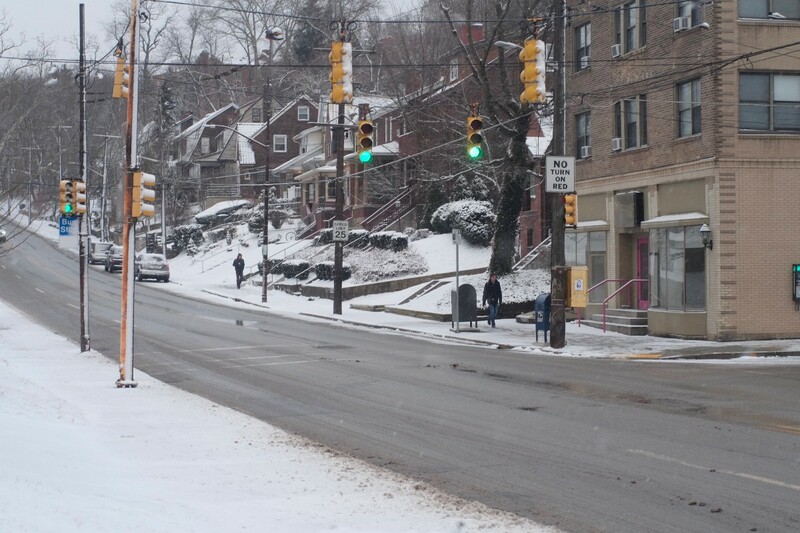 At the opposite corner is the 61 bus stop that takes students down into Oakland and on into Downtown. 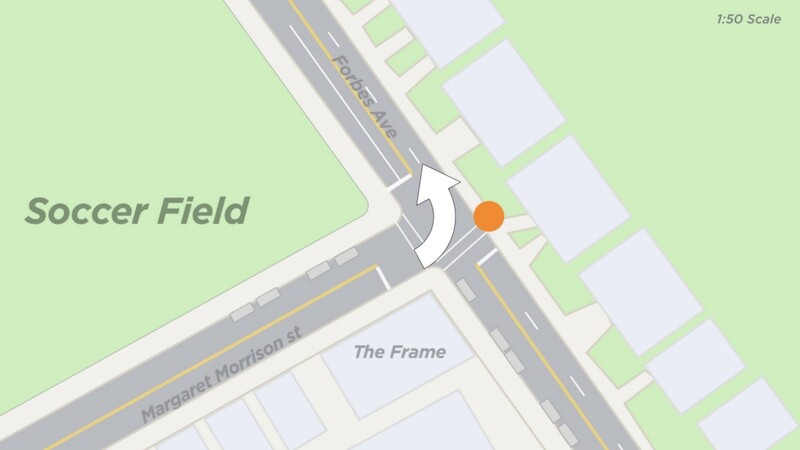 Additionally, if there are no cars turning left on Margaret Morrison st but the light is green, no cars are moving through the intersection at all. Pedestrians are further emboldened to cross because they can see quite far down Margaret Morrison st, determining that there is no danger now and there will not be any danger in the future. Here we see a case where the infrastructure really runs counter to how people desire to move through the space. Here is an example where the built environment explicitly tries to coerce and direct people into paths that they do not want to travel in. Students traveling from a certain part of campus to Beeler or students that are traveling down Forbes towards CMU end up crossing straight across this intersection. The two paths are charted below, and you can see that getting to and from campus really drives this pattern of movement. Unfortunatley, when people try to cross this portion of the intersection, they quickly realize that there actually is no crosswalk built. That’s right ladies and gentleman, the third crosswalk to complete this intersection is actually missing. I’m sure that there is a valid reason for this, perhaps something to do with the expense or the way that it would affect traffic, but nevertheless when you go to cross this part of the intersection for the most efficient path to your destination, you are quickly confronted with this gap in the built world. This final malfeasance may seem minor but is just as serious an infraction of road safety laws as the above two. Here we can see students cutting outside the crosswalk on their way to the large block of student housing that resides across the street. They are able to do this because of a large gap in between the edge of the crosswalk and the actual area where cars are intended to stop. 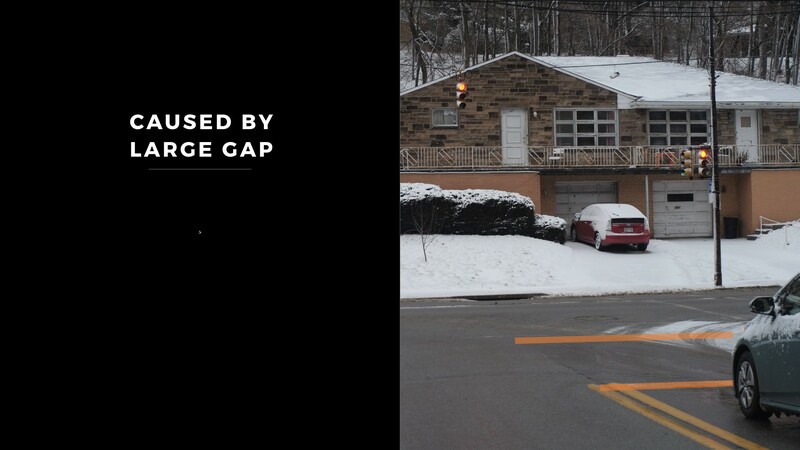 This gap creates a spatial ‘no-person’s-land’ where the rules are unclear and people feel okay walking in. An interesting interaction of the built world and the policy that governs how people operate vehicles in this environment has a spectacularly awful result which can be seen above. Busses, within the span of less than 10 feet, have to move out of the right lane where they were picking up passengers, and into the left lane which may or may not have moving traffic in it as well. From there, they continue down Forbes in the left lane. Well, why is this the case? The section of Forbes avenue highlighted in red is all no street parking. 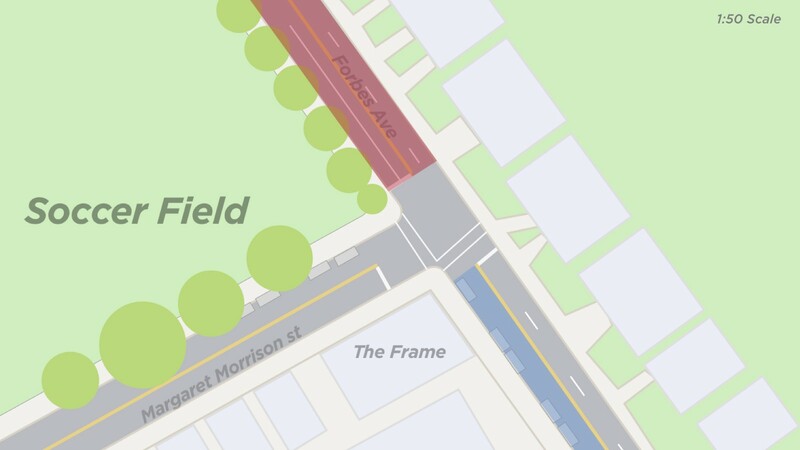 However, the one area of Forbes that does allow street parking is highlighted in blue. This means that if there is a parked car on the side of the road in blue next to the frame, no cars can drive in the rightmost lane. All bus traffic must suddenly move out of that lane to avoid such cars. You can see the problem even more clearly in the image below, just how blocked a bus’s route out of the bus stop would be if a car is parked in the right spot. 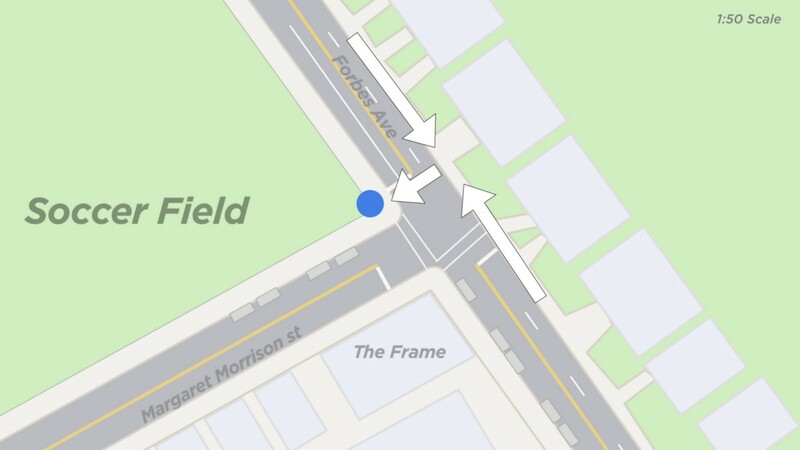 Cars can park as close to the intersection as the blue square. This photo was taken of about the point of view of the bus stop. As a relatively simple intervention, a cursory analysis would lead one to believe that moving the no parking zone slightly up Forbes past this intersection would greatly alleviate this issues. 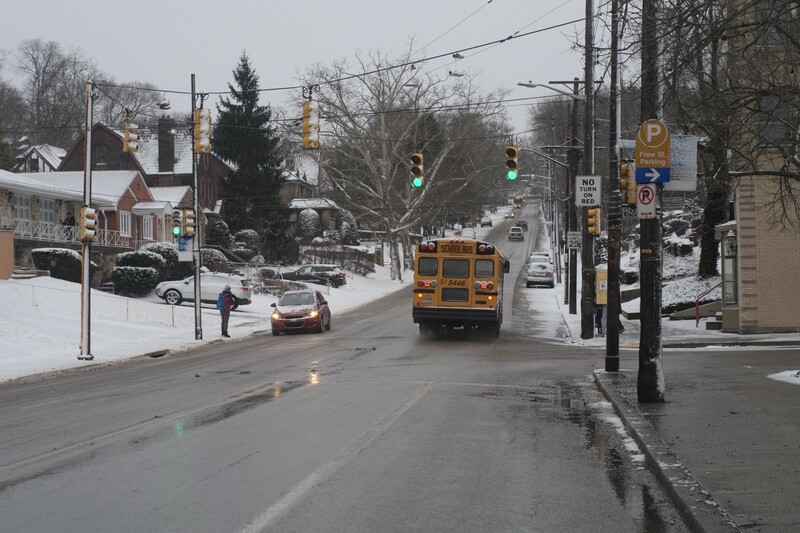 This would allow busses to more gradually transition out of the right lane as they travel into Squirrel Hill. There are many different things that I could have considered, clips left hanging around on my computer of different possible phenomenon that I noticed. However, without much further research, I could not verify whether what I saw was a one off occurrence or is a more generalizable observation. These two factors are, however, very clearly due to the design of the intersection, and that is why I have presented them here. While change may be slow on an issue like this, CMU’s student body grows ever larger and demand for housing close to campus grows with it. 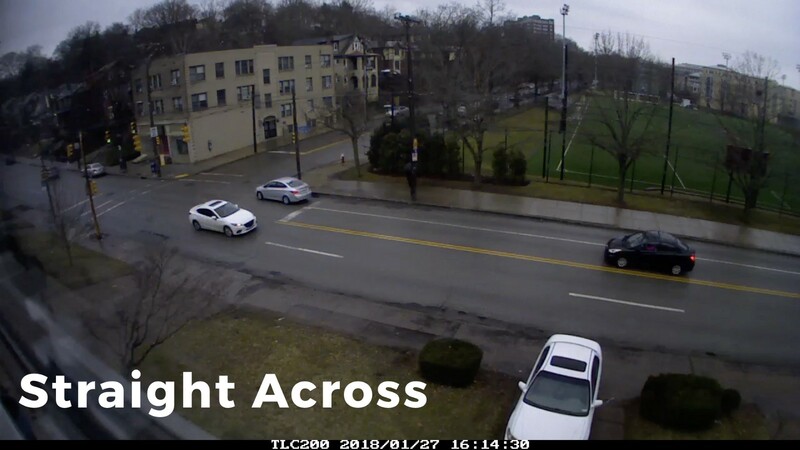 This puts pressure on local infrastructure, and we may have to see CMU’s leadership step in and work with local stakeholders to ensure safety and traffic flow through and around campus. “Social Life of Small Urban Spaces (1980).” IMDb, IMDb.com, www.imdb.com/title/tt1778327/. IEPEart. “PAINTING REALITY — the official -.” YouTube, YouTube, 18 July 2011, www.youtube.com/watch?v=N1AHBZybjW4. “Port Authority could see 5 percent cut in service under latest Pa. funding plan.” Pittsburgh Post-Gazette, www.post-gazette.com/news/transportation/2017/09/21/Port-Authority-service-cut-pennsylvania-budget/stories/201709210135. Environments Studio 2 Process. The process of designing environments of uncountable types. From CMU School of Design.